This fall Starbucks is bringing the baristas on campus … literally with Starbucks food trucks. Ask any college student to name the food groups and chances are they’ll include an additional group. Coffee, Joe or Java call it what you want but it’s critcal to many college kids as the proverbial late night pizza. 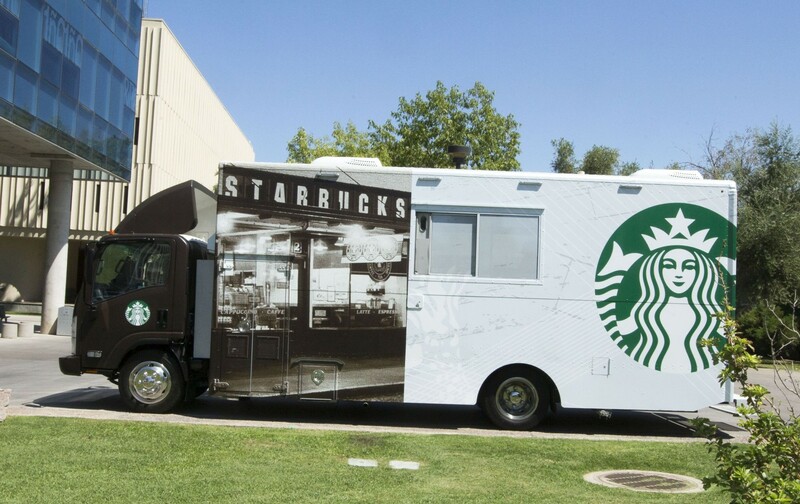 Starbucks is experiementing at three colleges, Arizona State University, James Madison University, and Coastal Carolina University with the latest in food trucks or as Starbucks calls it mobile service. Just like its more traditional food truck cousins, as Starbucks food trucks can easily move to areas of the campus that have none or limited food service. Hours can be adjusted to co-incide with the beginning or end of a class, school events, exams, concerts. Think about it. These students have grown up in a world where technology brings media, games, information, eBooks even streaming classes, to them when and where they want it. Why not the coffee experience? Starbucks has tapped into an audience where convenience is part of its culture and lifestyle. The challenge is for Starbucks food trucks to ensure its unique customer experience translates to wheels. Hey Starbucks, how about Starbucks On The Beach next summer?